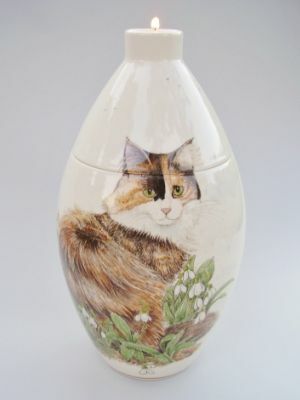 Because of the detailed art work and unique shape this Cat & Snowdrops ceramic urn is hardly recognisable as an urn. It is a true work of art, which can blend into the surroundings of your home. This urn can be adapted to reflect upon the special memories of your loved one with a completely unique design. You may also wish to add a special poem, name, date of birth, date of death or special song text. The urn comes complete with a candle holder in the top (except the keepsake). Please note delivery of this urn is approximately 12 weeks. They are available in three sizes and a keepsake urn. The large measures 13.7'' high and has a volume of 3.5 litres which is suitable for holding the full ashes of an adult. The medium measures 9.8'' high and has a volume of 2 litres which is suitable for holding part of the ashes of an adult or all of the ashes of a child. The small measures 6.3'' high and has a volume of 0.33 litres which is suitable for holding part of the ashes of an adult or the ashes of a small child. The keepsake urn measures 2.7'' highand is suitable to hold a small amount of ashes of a lock of hair as a way of keeping your loved one close to you. Please choose the correct size for you from the product options below.